from Grahame L. Newnahm B.Sc. A cartoon character of a mischievous pup was created by George Studdy around 1911. Over the following years this character became known as the Studdy Dog and, from 1921, began to regularly appear in The Sketch magazine, which was published by the London Illustrated News. 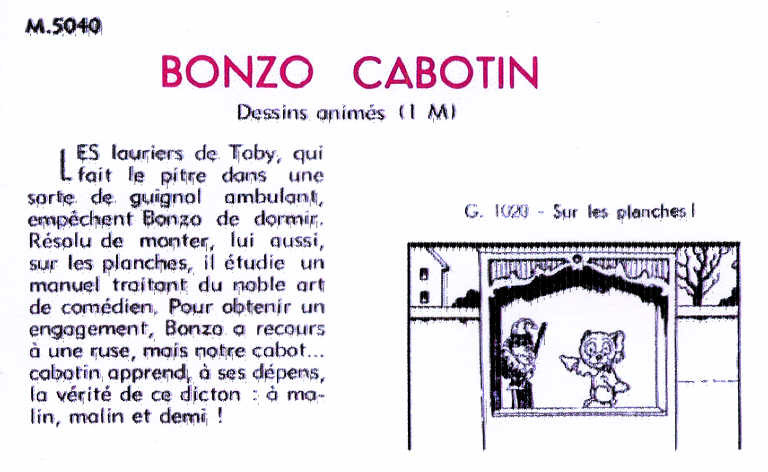 It seems Bonzo's name came from The Sketch's editor because, apparently, readers had been contacting him asking for the loveable character to be named. 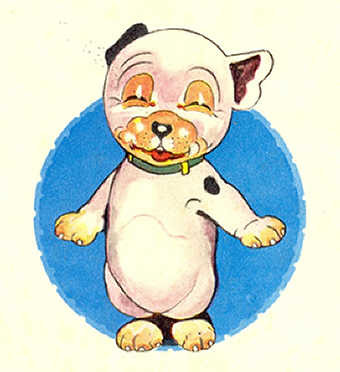 The Bonzo dog character became very popular and was popular not only in the UK but all over the world. A wide range of Bonzo merchandise was produced including models, car mascots, jigsaws, soft toys, ashtrays, perfume bottles and other products. Such was his popularity that Royal Worcester and Royal Doulton produced porcelain figures of the nation's favourite dog. The first film starring Bonzo, entitled 'Sausage Snatching Sensation', was premiered on 14th October 1924 at the Marble Arch Pavillion, London. It was attended by King George V and Queen Mary, the first time a reigning sovereign had watched a film performance in a public cinema! Despite disappearing from his regular weekly cartoon slot Bonzo was still popular and featured in a number of books. 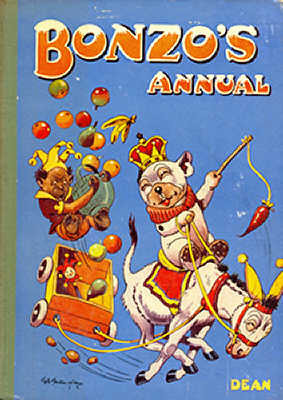 The first Bonzo Annual was produced in 1935 and was called Bonzo's Laughter Annual. Production stopped during the war but resumed and then continued for four years after Studdy's death with the illustrations for the last years being drawn by other artists. Bonzo the dog's creator was George Ernest Studdy. He was born in Devonport, Devon, UK in 1878, parents Ernest and Constance Studdy; the second of three children. His preparatory education started at Clifton College, Bristol, but a pitchfork injury to his foot required numerous visits to a London hospital, so his education continued at Dulwich College whilst he stayed with his aunt between hospital visits. Unable to follow his father's footsteps into the forces he worked briefly as an apprentice engineer and a stockbroker before attending Heatherleys Art School and, briefly, Calderon's Animal School. George Studdy had begun in animation back in 1914 with 'Studdy's War Studies' but didn't begin the Bonzo cartoon films until the character had been established in comics, strips, magazines and postcards. 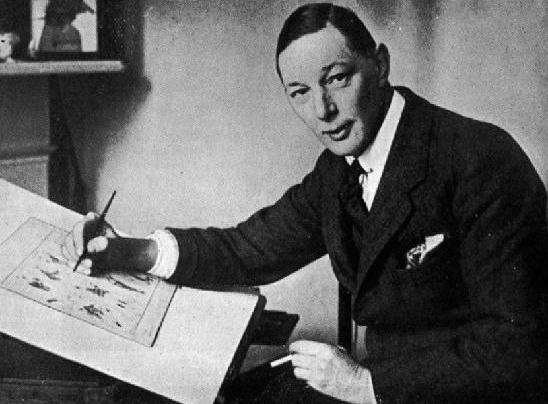 The Bonzo cartoons were made in close collaboration with his director William A. Ward. Writers included Adrian Brunel, later a well known film director, whilst his animators included Brian White, later the creator of the popular Nipper cartoon strip. George Studdy also drew for postcards and for many years produced work for Valentine Postcards of Dundee. 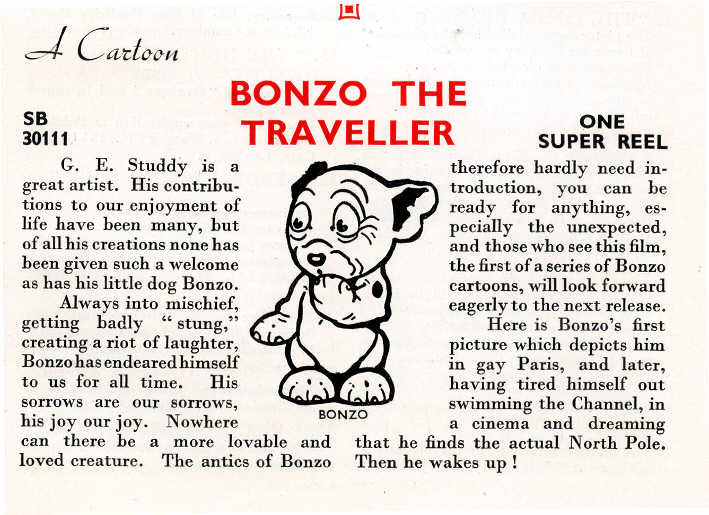 In 1921 Bonzo started to appear as a regular feature in the Sketch Magazine and continued to appear until he was retired in 1927. After a short break from The Sketch, Studdy returned with a new character - a cat called Ooloo and sadly Bonzo only made a few brief appearances in future editions. George Studdy died in 1948, at the age of 70, after a short illness. 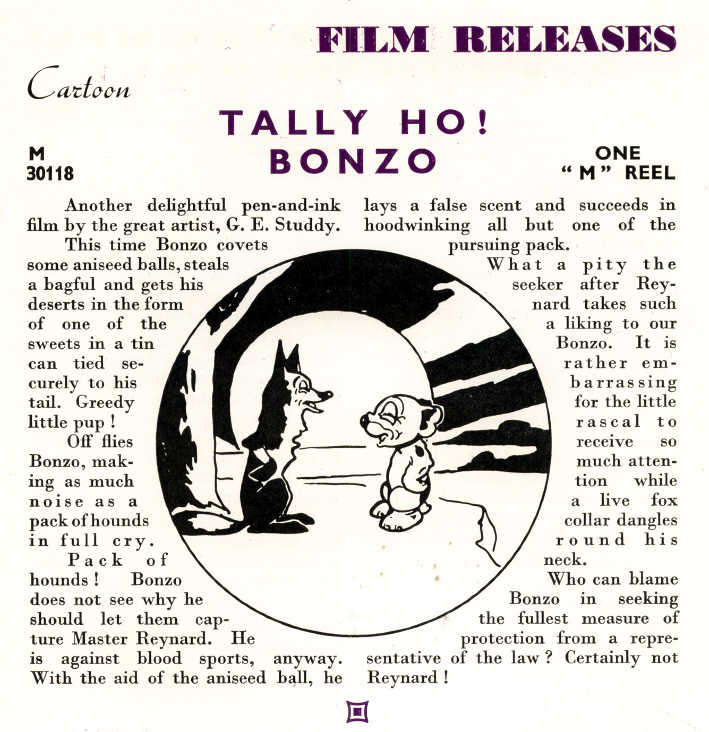 So far as I can establish, whilst Pathé-Baby in France released many 'Bonzo' cartoons on the 9.5mm film gauge; only two 'Bonzo' cartoons were actually released on 9.5mm in the UK by Pathéscope Ltd. The 9.5mm prints were silent, but then so were the original cartoons. Most of the 'Bonzo' 9.5mm releases are listed below. (Researcher Maurice Trace has discovered another Pathéscope 9.5mm release was scheduled for April/May 1935, but there is no evidence of any prints being produced). 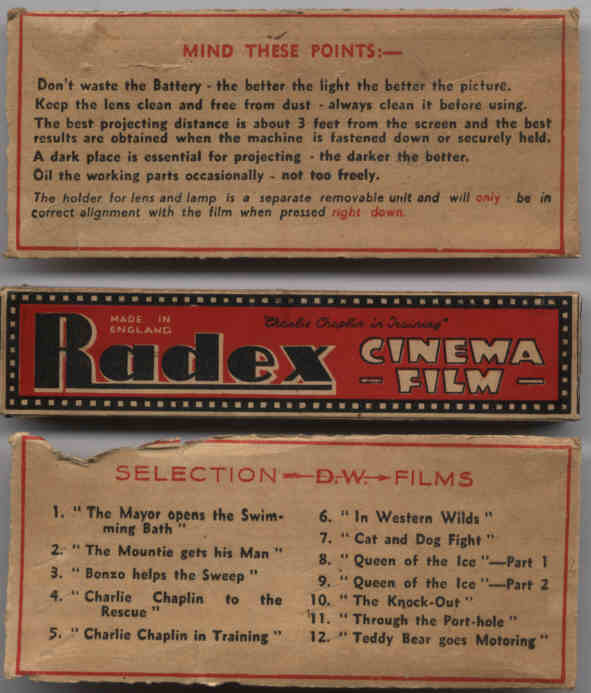 I have listed the 9.5mm film releases below, and used illustrations in the UK Pathéscope house magazine "The Pathescope Monthly" and the French Pathé-Baby "Filmathèque" film release booklets. Maybe there are other Bonzo titles released elsewhere still to spot? The French Pathé-Baby plot descriptions may be the only information we can find on some of these Bonzo films. 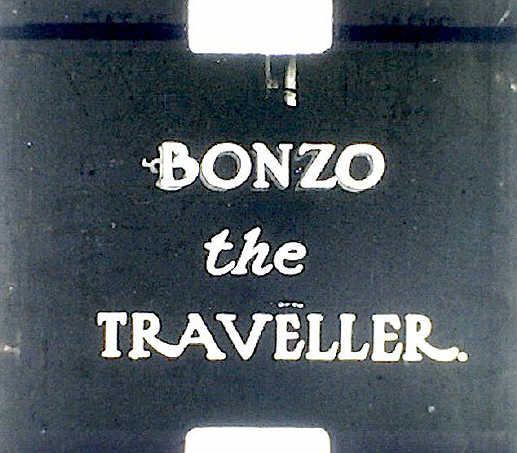 note the title is incorrectly printed as 'Bongo The Traveller" - at least the title on the film itself is correct! Number fourteen in the series - Bonzo has adventures in Paris after his plane crashes, later he swims the English Channel and wins a trophy. 9.5mm silent Pathé-Baby France as G.10425 "Bonzo A Paris"
9.5mm silent Pathé-Baby Spain  as G.10425 "Bonzo En Paris"
Note - the 9.5mm Pathéscope print of "Bonzo The Traveller" begins with "Bonzo In Gay Paree" & ends with "Polar Bonzo"
9.5mm silent Pathé-Baby France as M.4619 & M.5019 "Bonzo Perd Le Nord"
'Bonzo has taken the train for Scotland together with a brave highlander, who is travelling without a ticket. 9.5mm silent Pathé-Baby France as M.4621 & M.5025 "Bonzo, Maître Renard Et Cie"
Original title currently unknown. All information gratefully accepted! . There seems a possible original title, but no extra information. All information gratefull accepted! . nor does there seem a suitable known original title. All information gratefully accepted! . 'Bonzo is Working In An Antique Shop'. 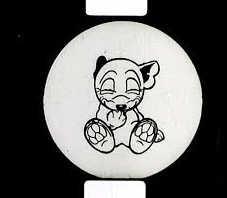 releasing his Mickey Mouse cartoons the following month - August 1935!! Just when I thought this page was finished I had a nagging feeling that I remembered our friend Bonzo from elsewhere. However these little 9.5mm films were only 2ft long, so hardly worth showing as they would run for just about 5 seconds! These little 9.5mm film loops were rather the same as those marketed as 'Fairy'. web-site 9.5mm film cataliogues listings. Blame me (and schoolboy French) for the translations!